Below are some jump links to help you quickly navigate to the type of image you’re looking to create. These image tools range from free to premium, and from desktop software to mobile apps, so there should be enough tools here to fit all of your needs. There are dozens of free image editing tools out there that you can use to start altering, touching up, or creating your own social images. These are some of the best ones we found with simple web-based interfaces. Canva may be the most all-inclusive tool on this list. There are so many different design templates that make it easy for users to create images. Canva also has social media templates, making it easy to create social media images, including: cover photos, profile pictures, posts, and advertisements. PicMonkey is a fantastic tool for editing or designing brand new images for your social media posts. One of the best parts of PicMonkey is its blog, where it publishes fantastic guides to help you create your own free images. BeFunky is a photo editing tool that doesn’t require users to register, which is a big plus for a lot of people. The site has tools for making edits and adding effects, and even includes a collage creator. Using an infographic maker is an easy way to share big sets of data in a visually pleasing way, which is one of the reasons marketers find them to be some of the most shareable pieces of content they create. Made well, infographics can explode in popularity and drive a lot of traffic to your site. Venngage has both free and paid accounts that make it incredibly easy to create and share your own infographics. 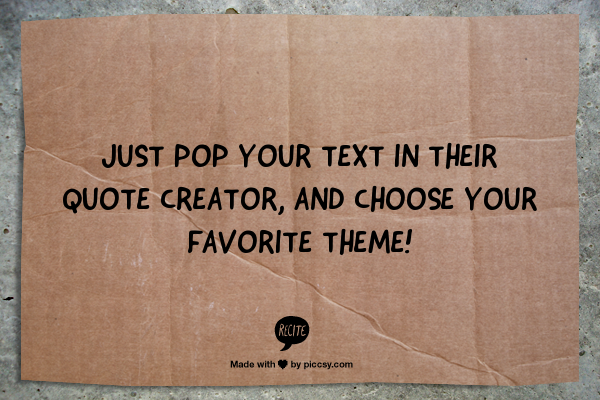 Simply choose a theme, alter the text and data, insert some graphics, and share! Infogr.am is a great tool for illustrating big data and creating infographics that are ready for your audience. There are a number of great features available for free, but to access the full suite you’ll need a paid account. Infoactive is another fantastic tool for creating interactive infographics. However, you’re only allowed three free infographics. Once you’ve reached your quota, you’ll have to pay for the basic $30/mo plan. Since logos are such an important piece of your brand, and seen by most of your target audience, it may be wise to spend a little bit of money when creating one. That’s why it may be wise to consider upgrading to the premium plans for these free tools. LogoGarden is a fantastic free option for logo creation. It’s a great option if you aren’t super design-oriented and don’t mind using existing imagery to create your logo. Logotype Maker is a site for small companies and startups looking to create their logos. The site has over 200 custom fonts, custom sizes, a handful of special effects, and more. /r/picrequests — This is a community of users that helps others create new images or improve ones they already have. Sometimes you’ll be able to get a request done for free, sometimes you may have to offer a tip. /r/Entrepreneur — A basic Reddit search brought back a handful of subreddits with users offering to create free logos. /r/Entrepreneur seemed to have quite a few users doing it. These are a set of tools that not too many people know exist. These sites will take a quote that you have and turn it into a beautiful image that you can go on to share on social. The ease of creating and sharing content make these a great tool for marketers posting frequently. “Turn A Quote Into A Masterpiece” with Recite. The site has a ton of different design themes which will easily make your quote look great. Just plug your quote into the box they provide and choose a template. Quozio is another tool for creating and sharing a quote design. The site does lack some sharing features that Recite has, which makes it more difficult to publish your quotes. Quotescover is great for turning your fantastic quotes into social media cover photos. The site allows you to create quote designs for Twitter, Google+, and Facebook. You’ve undoubtedly seen photo collages all over social media sites, most likely in a post celebrating someone’s birthday. Collages are great for telling a story on social media. Here are some of the tools we’ve found that make collage creation easy. Fotor is a great free site for putting together a photo collage. You can pull photos from your computer, Dropbox, Facebook, Flickr, Picasa, the web, or any camera you have set up with your computer. Photovisi is a simple tool for creating a photo collage. It’s as easy as choosing a theme, adding your photos, choosing additional text and shapes, and letting them put it together. The only downside is that you’ll have to pay $1.99 to get your collage without the watermark. Smilebox is a desktop program instead of a web-based tool. Some users may prefer this, and there are a lot of perks, like being able to create new images without having to be connected to the Internet. Cover photos are arguably the most important images that you’ll use on social networks. They have some of the biggest dimensions, and are usually the first thing customers see when they visit your page. Here are some tools to help you create the perfect one. Fotor has a fantastic tool for creating and editing the perfect Twitter cover photo. Simply upload an image from your computer, Dropbox, Facebook, Flickr, Picasa, the web, or your webcam. Add some graphics or text, and you’re set! Fotor also has a tool for creating and editing the perfect Facebook cover photo. Just like the Twitter version, you have the same ability to upload images from a variety of sources. It’s very simple and intuitive to use. Pagemodo boasts more than a million users and has a lot of great features, like professionally designed themes, access to thousands of free stock images and shapes, and the ability to upload your own images. Once you’ve drawn in visitors with your vibrant and unique cover photo, it’s likely that the next most important visual they’ll see is your profile picture. That’s why it’s necessary to create a great image for your page. This site is equipped to help you create great photos for Facebook, Twitter, LinkedIn, Google+, Pinterest, and Myspace. There are tons of great frames and themes for you to choose from. This is a site that allows you to upload a photo in order to resize it to perfectly fit profile image dimensions for various social sites. This site works to incorporate your profile picture and cover photo into the same image, which helps create a unique look. Taking a screenshot of something on your monitor can sometimes be a quick and effective way to generate an image for a social media post. Most computers and laptops have their own screenshot tools, but we listed some here that have some more comprehensive editing features. Jing is a free tool that lets you capture both screenshots and screen videos, which you can then easily share with a custom shortened URL via Screencast. Jing also has tools to edit the image that you’ve captured with text, shapes, and colors. Awesome Screenshot is a browser extension with a ton of great features for capturing screenshots. Its editing tools also help you to create helpful annotations and comments on top of an image. Similar to Jing and Awesome Screenshot, Skitch also boasts great features for editing your photos on mobile — a big plus for social media managers and content creators on-the-go. These types of tools are fantastic because they allow you to take all of the images that you already have, and crop them to meet the exact specifications of each social network. If you need those specifications, check out this guide to social media image sizes that we’ve put together. We realize that it’s difficult to keep up with the ever-changing image dimensions of the social networks, and now you don’t have to. Landscape is a social media image resizing tool created for social media. Simply upload your photo, choose the networks and post types you’d like to resize your image for, guide the cropping process and download all of your new images. With the Simple Image Resizer, all you have to do is upload a photo and choose the new dimensions that you’re looking for. Picresize is another picture resizing tool, boasting more than 67 million resized pictures to date. Need to save time managing social? See how Sprout Social can increase your efficiency and help you engage with your audience with a free 30-day trial. Sign up now! The pronunciation of the word GIF may be heatedly debated but its popularity isn’t. Though not all social networks allow GIFs to play in your feed, viewers can still click through to see them. Here are some tools to help you put GIFs together quickly. MemeCenter has a pretty incredible free GIF creation tool. There are tons of tools to edit the video, draw shapes, and add text. You can also upload videos from a number of different sources. Phhhoto is an application for mobile that lets you take pictures in motion, which end up looking very similar to a traditional GIF. Don’t let those new GIFs go to waste. Try our Social Media Management platform for FREE! Although memes can be overly informal, they can be a good way to connect with a lot of younger audiences if used strategically. Just make sure that you follow standard meme guidelines when creating one — incorrectly using a meme can lead to public ridicule. The Imgflip site is good for creating memes quickly, since it requires no registration. Find popular memes fast, add your text, and share to multiple locations with ease. MemeCenter includes a ton of different editing tools, which can make it a bit more complex to quickly create an original meme. It’s a bit more difficult to immediately share to your social sites, so you may need to download the image and share it individually. Quickmeme features a lot of the trending memes right on the landing page, which makes it easy to create timely visuals that are likely to get shared more frequently. We chose to do a special section on Pinterest because we know just how great of a platform it can be for sharing your images and driving traffic to your website. The Pin It button from Pinterest makes it easy to quickly share images to your boards right from the web. Simply click the Pin It button, choose a board to pin the image to, write a description, and you’re set! This is a site that allows you to create completely custom images, overlay text and completely customize them for your brand. Pinstamatic is a Pinterest creative tool that was built solely to help your efforts on this social network. There are a bunch of different tools like adding notes, photos, and music to your Pinterest boards.